The visit was arranged to enable year 11 pupils to gather infor­ma­tion and carry out research that will enable them to answer the three ques­tions that make up their con­trolled assess­ment tasks. Each pupil was issued with a work­book that encour­aged them to focus on the rel­e­vant fea­tures of the site. Pupils explored the fol­low­ing phys­i­cal fea­tures of the site: the square stone keep, the fore­build­ing, the Roman Pharos, the Saxon church, the inner cur­tain wall, remains of the pre­his­toric fort, the medieval tun­nels and main entrances to the site. This involved a great deal of walk­ing up stairs and along steep tun­nels. A few com­plaints of aching legs could be heard through­out the day. On the day of our visit we shared the site with mem­bers of a film crew who were prepar­ing for film­ing scenes from ‘Into the woods’, star­ring Johnny Depp and Meryl Streep, the fol­low­ing day. This pro­vided pupils with an extra inter­est for the day! The entire Geog­ra­phy group in Year 11 were taken to Can­ter­bury in order to com­plete their field­work for their con­trolled assess­ment. The groups boarded the bus in high spir­its just after 9 in the morn­ing and enjoyed their jour­ney on the dou­ble decker into the City. Once in place the group were split into two and both got going with their work com­par­ing the White­fri­ars area of the City and that of the West­gate Tow­ers. Mr Sellen and I had the ardu­ous task of ensur­ing they com­pleted all work to the best of their abil­ity, the biggest chal­lenge proved to be to encour­age the ask­ing of sur­veys to the gen­eral pub­lic! The stu­dents did a num­ber of tasks at each site, pedes­trian counts, bipo­lar assess­ments, sketch maps, shop­ping tally charts etc. After lunch the groups swapped over and by now bud­ding with expe­ri­ence com­pleted their sec­ond site in record time. 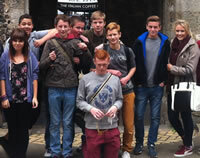 The groups were bril­liant and a credit to the school!! Year 11 and 12 sport and pub­lic ser­vices stu­dents spent a morn­ing ses­sion being put through their paces with two Royal Marines. An ener­getic morn­ing, com­plet­ing team build­ing and lead­er­ship chal­lenges, with var­i­ous ‘for­feits’ for the los­ing teams. The pupils ben­e­fited hugely from this expe­ri­ence and our recep­tion­ists were cer­tainly impressed when the Marines arrived in the morning! King Ethel­bert School are cel­e­brat­ing record break­ing results this year which has seen GCSE grades soar and indi­vid­ual stu­dents mak­ing excep­tional progress at every level of abil­ity. 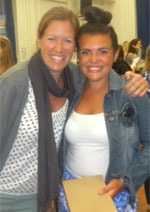 53% of the stu­dents achieved 5 A*-C grades includ­ing Eng­lish and Maths which is a 23% increase from last year. 60% achieved an A* — C in Eng­lish, 60% in Maths. As well as the superb head­line fig­ures which have smashed all the gov­ern­ment tar­gets by a long way, the school has also got the high­est ever per­cent­age of the top grades A and A* in all sub­jects. 66% of stu­dents achieved 5 A* — C grades (an increase of 12% from last year) and 91% of stu­dents gained at least 5 GCSE passes. King Ethel­bert School is cel­e­brat­ing its first set of Year 13 results with 100% of stu­dents pass­ing their Inter­na­tional Bac­calau­re­ate Careers Related Cer­tifi­cate or IBCC at the high­est grades.